RCRA Regulations & Keyword Index, 2019 Edition contains an indexed compilation of the federal hazardous waste regulations, which implement the Resource Conservation and Recovery Act (RCRA). This reference is specifically designed to make the RCRA hazardous waste regulations more usable. 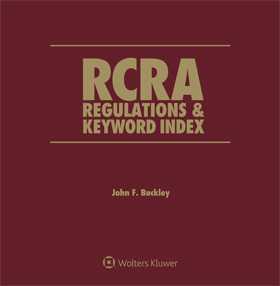 RCRA Regulations & Keyword Index, 2019 Edition is composed of individual chapters that cover all of the major "Parts" of the RCRA regulations. Each of these chapters begins with a brief overview of the regulations that are discussed in the chapter and a summary of the changes made during the previous year. The essential reference for anyone working in, or advising on, hazardous waste management, this valuable resource helps you navigate RCRA regulations, RCRA hazardous waste list, RCRA waste codes, and more. What is the purpose of the RCRA? How do I identify and list hazardous wastes? What are the standards applicable to generators of hazardous waste? What are the standards for transporters of hazardous waste? What are the standards for owners and operators of hazardous waste treatment, storage and disposal facilities?